Out of all the desserts I’ve made I think Tiramisu has been my favorite. In all honesty though, it’s always been one of my favorite desserts. Today, I’m bringing you a twist on the classic Tiramisu, a White Chocolate Blackberry Tiramisu. And now is the perfect time to make it with berries, including blackberries, being in-season. To begin I soaked ladyfingers in a mixture of orange juice and blackberry liqueur and arranged them in a 11×7 inch baking dish. 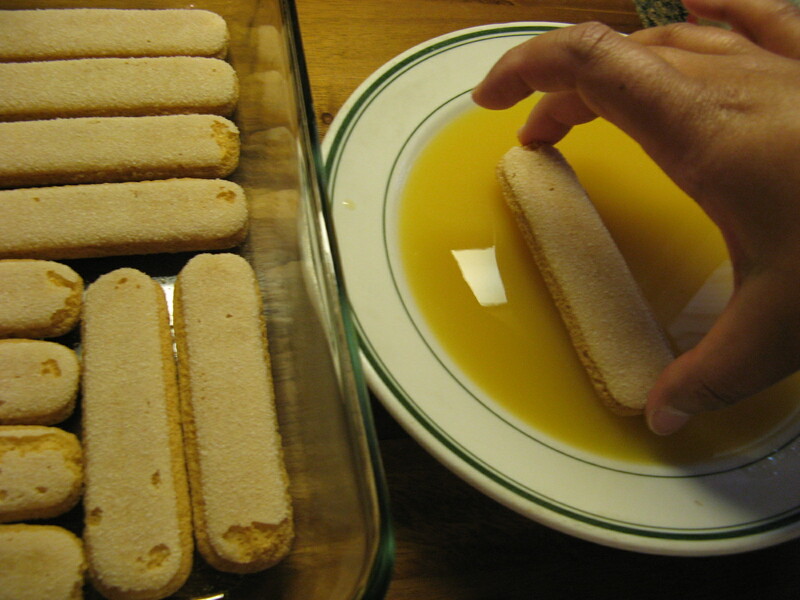 Don’t let the ladyfingers soak up too much of the liquid, you don’t want them to become mushy. Next, I melted white chocolate in a double boiler. I don’t own an actual double boiler, so, I created my own by simmering water in a pot and then placing a heat-proof bowl over the water without touching it. Once the chocolate had melted I let it cool slightly and in another bowl I beat cream cheese, vanilla extract and confectioners’ sugar until creamy. I then stirred in the melted white chocolate. In another bowl, I beat heavy whipping cream until stiff peaks formed and took 1 cup of the whipped cream and folded it into the cream cheese mixture. And finally, I spread half of this mixture over the ladyfingers. On top of the cream cheese mixture I laid an even layer of fresh blackberries which I pressed lightly into the cream cheese. I then dipped the remaining ladyfingers into the orange juice / liqueur mixture and placed them on top of the blackberries. With the remaining cream cheese mixture I added in more confectioners’ sugar and then folded in the remaining whipped cream and spread this over the second layer of ladyfingers. 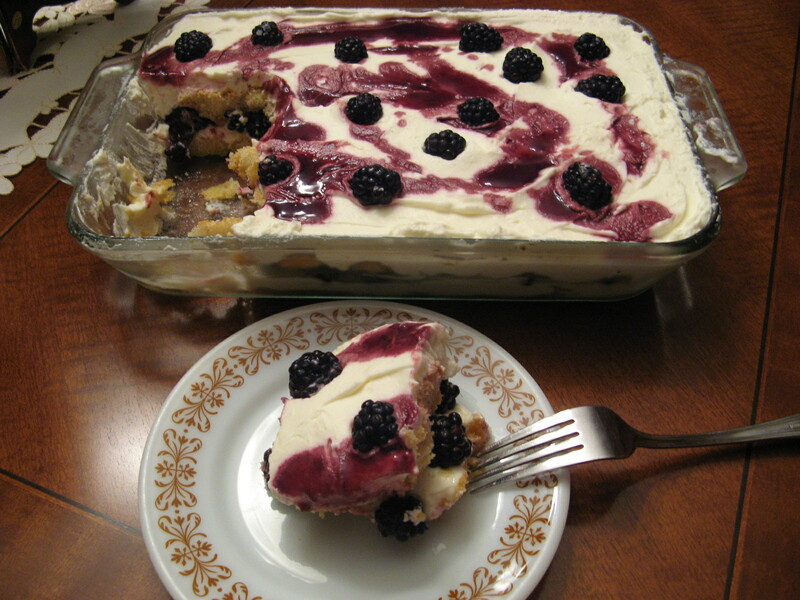 To top it off, I melted a few tablespoons of blackberry preserves and combined it with a tablespoon of the blackberry liqueur and then drizzled it over the tiramisu and then topped it with some fresh blackberries. And it was delish… Sweet, but just sweet enough! Combine orange juice and liqueur in a shallow bowl. Dip half of the ladyfingers in the orange juice mixture – a quick dip will suffice – and line the bottom of an 11×7 inch baking dish. Melt the white chocolate in a double boiler. If you don’t have a double boiler you can create one yourself by simmering water in a pot and placing a heat-proof bowl over the water without allowing it to touch the water. Once melted let the chocolate cool for a few minutes. In a large mixing bowl beat the cream cheese along with the vanilla extract and 1/4 cup of the Confectioners’ sugar until creamy. Stir in the melted chocolate and let the mixture cool for about 5 minutes. In another bowl beat the whipping cream until stiff peaks form. 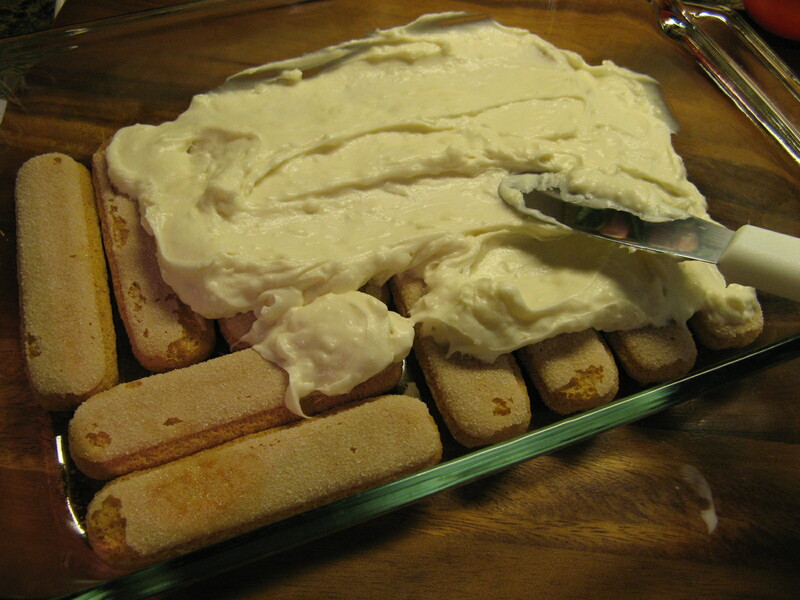 Fold 1 cup of the whipped cream into the cream cheese mixture and spread half of it over the ladyfingers. 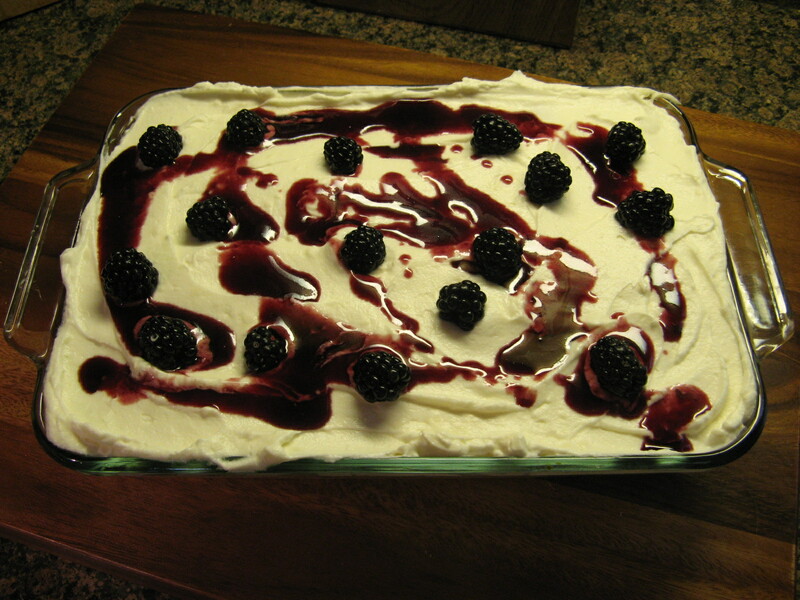 Lay about 1 1/2 cups of the fresh blackberries over the cream cheese mixture, pressing down slightly. 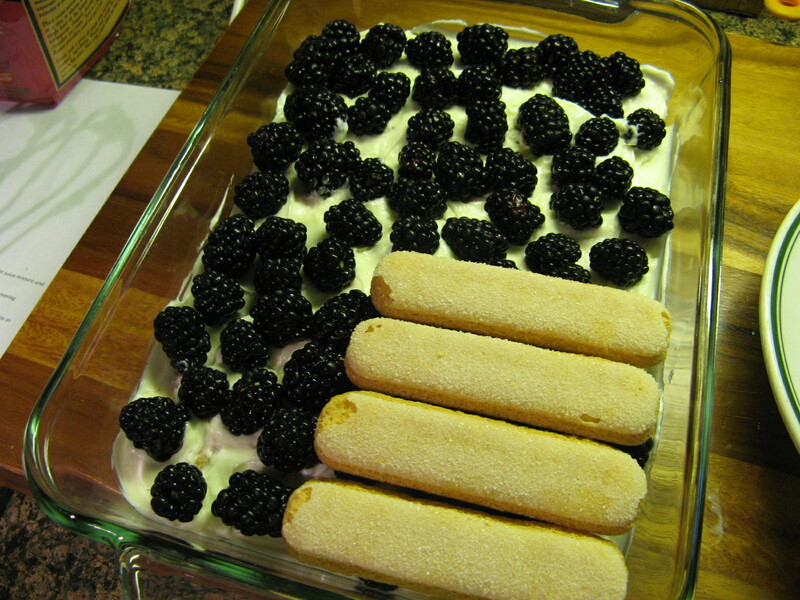 Dip the remaining ladyfingers into the orange juice mixture and arrange them over the blackberries. Add the remaining 1/2 cup of Confectioners’ sugar to the remaining cream cheese mixture, then fold in the remaining whipped cream. Spread this mixture over the second layer of ladyfingers. In a small bow mix together the melted preserves and liqueur and drizzle over the top of the tiramisu. And finally, top the entire thing with the remaining blackberries. Chill 3-5 hours and Enjoy!